This CellML version of the model has been checked in COR and OpenCell and the model runs to recreate the published results. We are grateful to the model author for their assistance in getting this CellML version of their model running. A PCEnv session is also available for this model and reproduces part of Figure 5 from the publication. ValidateCellML confirms this model as valid CellML with full unit consistency. Circulatory autoregulation can be defined as the ability of an isolated organ to maintain a constant, or almost constant, blood flow rate over a range of perfusion pressures. In the study described here Annraoi De Paor and Patrick Timmons have developed a mathematical model which is based on physiological data. Simulation results demonstrate that autoregulation can be achieved by pressure-induced oscillations in the arteriolar radius. Schematic diagram of the De Paor et al model. 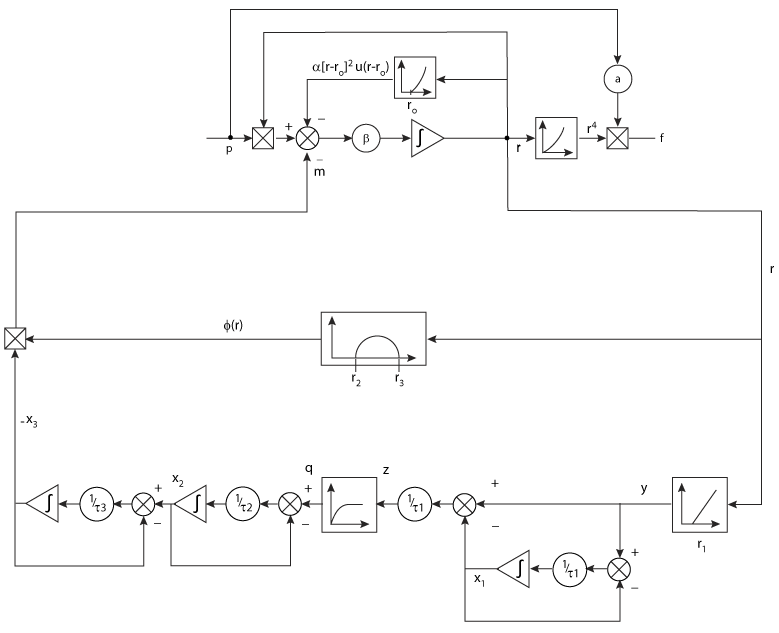 A feedback oscillator model for circulatory autoregulation, Annraoi M. De Paor and Patrick Timmons, 1986, International Journal of Control , 43, 679-688. Derived from workspace Depaor, Timmons, 1986 at changeset e93bf019cc3a.